U.S. industrial production strengthened in May, rising for the third time in four months and at a faster pace than analysts expected. The Federal Reserve reported that manufacturing and mining output increased while utilities fell for the fourth month in a row following the severe winter. 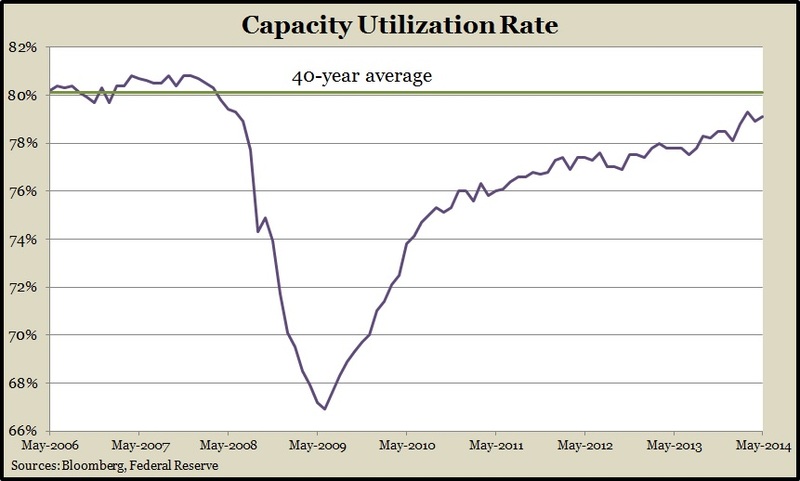 Capacity utilization rose to its second-highest level in six years, just shy of the longtime average, above which inflation tends to become more of a threat. The broadest measure of inflation, the Consumer Price Index, also grew more than expected in May, rising for the fourth month in a row. The year-to-year core inflation rate reached 2%, the highest in 15 months, the Bureau of Labor Statistics reported. That has been the Fed target rate for inflation and is down from the 30-year average of 2.8%. Housing continued to recover at a slower pace in May, contracting 6.5% from April but surpassing the 1-million rate for only the fourth time since the 2008 financial collapse. Multi-family houses continued to be a bigger part of the housing starts. The Commerce Department reported that building permits also fell in May, suggesting further weakening in new housing construction. The Federal Open Markets Committee, announced that it would continue tapering its economic stimulus program. In a statement following the committee’s regular meeting, the monetary policy making group said the economy keeps growing at a moderate pace, so it will cut its monthly investments to $35 billion, down from $85 billion as recently as December. The moving four-week average for initial unemployment claims fell for the fifth time in six weeks, dropping to the third-lowest level in seven years. but was still down 10% from the year before and continued to hover near five-year lows. Labor Department data suggest employers remain reluctant to let workers go. The Conference Board’s index of leading economic indicators rose less than analysts expected in May but climbed for the fourth month in a row. An economist for the business research group said that except for housing permits, indicators showed broad progress in the economy and a more robust momentum. The biggest challenge, according to the report, is maintaining income growth so that consumer spend more.